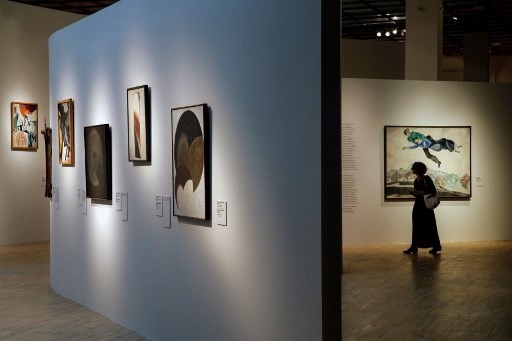 NEW YORK — A Chagall oil painting shining with love for his first wife and adopted home Paris sold for US$28.5 million in New York on Tuesday, almost doubling the artist’s previous auction record, Sotheby’s said. Considered one of the greatest works by Marc Chagall to come onto the open market, Les Amoureux had previously remained in the same family for nearly 90 years since 1928, the year it was painted. Sotheby’s said the painting unites the French-Russian artist’s two greatest loves — Bella, his childhood sweetheart, muse and first wife, and the French capital, his adopted home. The painting was chased by three determined bidders, with interest from Asia and Russia, in a more than 10-minute bidding war that soared well above its pre-sale estimate of $12 to $18 million. “That was, as you all know, a record for Marc Chagall,” said Sotheby’s auctioneer Helena Newman after bringing down the hammer to applause. The auction house established the previous auction record for Chagall in 1990, when Anniversaire from 1923 sold for $14.9 million.